After finally getting the latest version of App Insights Extension installed into Visual Studio, its been a breath of fresh air to use. Just a note, to get it installed, I had to go to to installed programs, hit modify on VS2015, make sure everything else was updated. Then run the installer 3 times, it failed twice, 3rd time worked. Now its installed I get a new option under my config file in each of my projects called “search”. 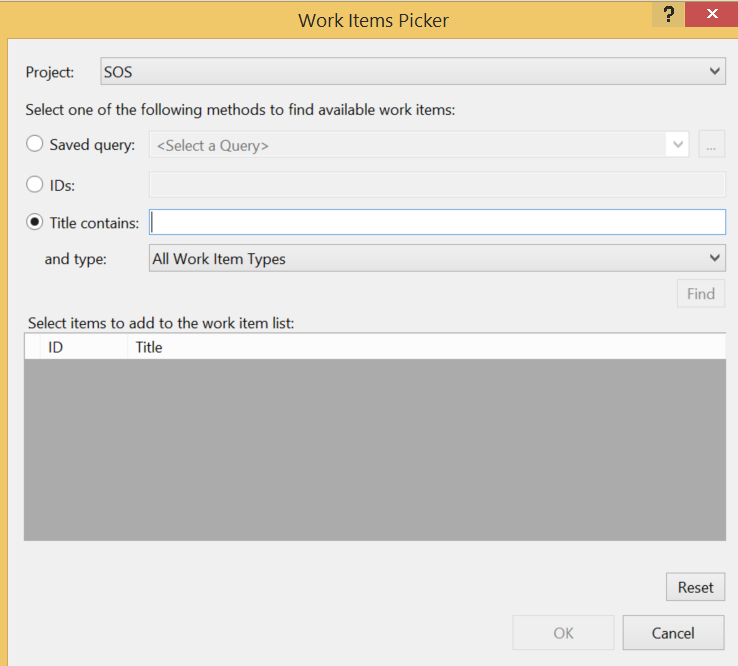 This will open the Search window inside a tab in visual studio to allow me to search my application data. The first time you hit it you will need to login and link the project to the correct store though, after that it remembers. From here you can filter for and find exceptions in your applications and view a whole host of information about them. Including information about the server, client, etc. But my favorite feature is the small blue link at the bottom. Click on this will take you to the faulting function, it doesn’t take you to the faulting line though (which i think it should) but you can mouse over it to see the line. One of the other nice features, which was also in the web portal. is the +/- 5 minutes search. You can use this to run a search for all telemetry within 5 minutes either side of the exception. In the web portal there is also an option of “all telemetry of this session”, which is missing from the VS interface, I hope they will introduce this soon as well. Below is an SQL dependency, this is logging all my queries. So I can see whats called, when, the time the query took to run, from which server, etc. This isn’t any extra code I had to write, App Insights will track all SQL queries that run from your application out of the box, once setup. And dependencies won’t just be SQL, they will also be SOAP and REST requests to external web services. Http Request monitoring the detail is pretty basic but useful. And Page views you get some pretty basic info also. Not as good as some systems i have seen, but defiantly enough to help out with diagnosing exceptions. I’ve been using this for a few days now and find it so easy to just open my solution in the morning and do a quick check for exceptions, narrow them down and fix them. Still needs another version or two before it has all the same features as the web interface, but defiantly worth a try if you have App Insights setup. I’ve been working with a lot of external systems lately that have their own objects that they serialize into either JSON or XML, and have found some good to tools to rebuild those objects into C# classes that i can add to my apps. However they don’t support invalid names, so i am going to use one int his example and how to work around it. JSON properties support dashes and periods, which are not supported in C#, so in C# there is support for a attribute “jsonproperty” that you can use like the below to fix the issue. In the example above i was reading a JSON object from a Azure Service Bus Queue. Lastly, thought i would add in the class i use for going back to XML. In this case i was working on today I was going to a PHP based system Kayako and it has some strange requirements. I created a class to inherit my XML objects from so add an extension method. Kayako only accepts UTF8 not UTF16, adn you need to remove the xmlns properties, which i do with the Namespace declaration above. The way I’ve changed UTF16 to 8 is a bit dodgy but it works for Kayako. Now i can just call MyObject.ToXmlString() and get a string for the XML data that i can pass into a HTTP Request. Noting that some of the Kayako methods don’t like the xml tag at the start, so if you need to remove this I’ve left in a bit of commented out code that you can use in the XML Writer settings initialization. We’ve been using a lot of Test Manager Lately and I am really happy with the work flow that is built into TFS with this product. We have full time testers who don’t have a lot of experience with code, so you can’t give them tools like the CUIT recorder in visual studio and expect them to run with it. But they are the best people to use tools like this because they understand testing more, and also in my experience testers tend to be more thorough than developers. The other thing I like about the workflow is that its “Documentation First”, so your documentation is inherently linked into the Test platform. Microsoft Test Manager’s recorder tools is a good cut down version of CUIT that makes things easier for the testers to record manual tests but not get caught up in code. The important thing here is the use of parameters, you can see in the above example that I am using @URL, @User and @Pass. In the test case you can input n number of iterations of these, then when creating the test recorder it will play back one iteration per set, this allows testers to go nuts with different sets and edge cases (e.g. 200 Ws for a name, all the special characters in the ASIC set for someone’s last name, Asian character sets, and so on). 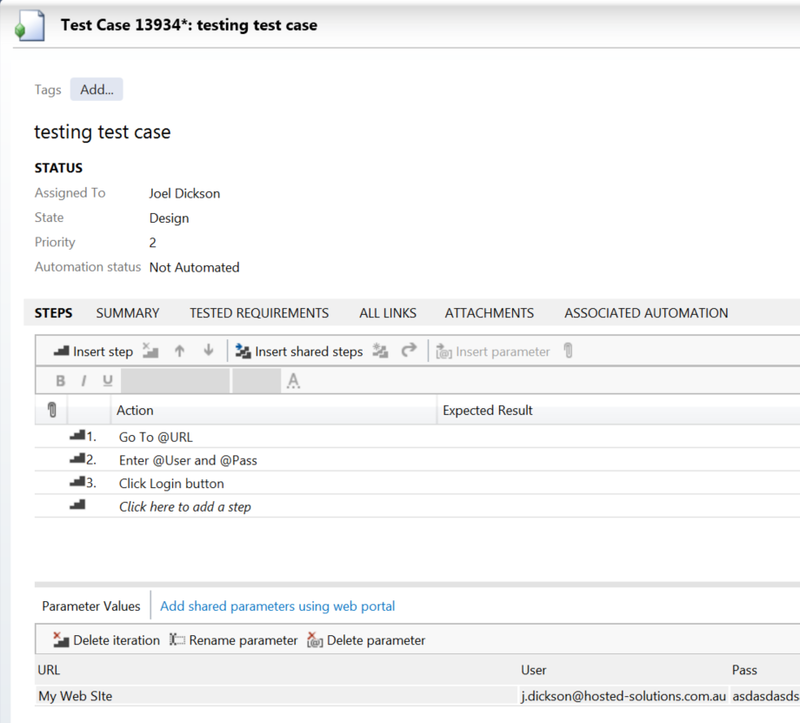 Once the documentation is done the test recorder is used (with IE, doesn’t work in other browsers) to save a recorded case. Which can then be played back while someone is watching, which is the first level of automation, i think this is an important first step, because in your development flow if you are working on a new features (requiring a new test case) then you want a set of eyes looking at it first, you don’t want to straight away go to full automation. It’s important to note though that the test recorder cannot be used to “Assert” values like CUIT, validation of success is done by the Tester looking at the screen and deciding. When you have past all your newly created test cases and your new features are working, Product Owner and stakeholders are all happy with the UI, this is the point you want to go to full Automation with your UI tests. 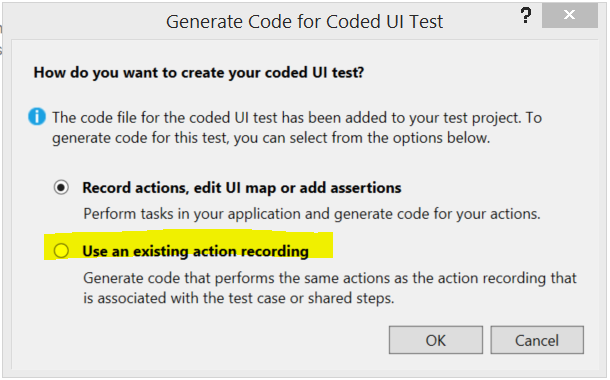 After selecting this you can search through your work items for the test case and Visual Studio will pull out the recording and generate your CodedUI test starting with what your testers have created. That will go through and generate something like the below code. The great thing about this is that we can see the attribute for the datasource, it refers to the TFS server and even the work item ID. so this is where the CodedUI test is going to get its data. So your testers can maintain the data in their Test Plans in TFS and the testing automation will look back into these TFS work items to get their data each time they run. Now that you are in the CUIT environment you can start to use the CUIT recorder to add Asserts to your tests and validate data. In the above example we might do something like Assert that username text displayed on the page after login is the same as the value we logged in as. Now we have a working Coded UI test we can add it to a build. I generally don’t do CodeUI Tests in our standard builds, I don’t know anyone that does, we use n-Tier environment, so in order to run a single app you would need to start up a couple service layers and a database behind it. So i find it better to create a separate solution and builds for the coded UI test and schedule them to run after a full deploy of all layers to test environment overnight. As in the example above, we put the initial “Open this URL in the Browser” step’s URL as a parameter, so if we want to change the target to another environment, or point it at local host, this is easy, and i defiantly recommend doing this. Now the thing I like about this is they all feed from the same datasource, which is a Documented Test Plan from your testers, who can then updated a single datasource that’s in a format they not only understand but have control over. Take the example you are implementing Asian Language support. In the above example you could simple add a new parameter set to the test case that has a Chinese character username in it, which could be done by a tester, then if it wasn’t support the build would start failing. Lastly I mentioned before IE only, that’s for recording, there is some plugins to allow playback in different browser that I will be checking out soon and make some additional posts about. This process also works well into your weekly sprint cycles, which I will go into in another post. Generally we check-in just development AppSettings that refer to things like “localhost:3456”, etc. but we have some instances where we can’t run the service on our locals. We use a separate project in TFS, octopus etc and sometimes separate servers, for our development work so we aren’t interfering with live systems, but the credentials and URL aren’t something i want appearing in GitHub public Repos. The above usage of the file property points to a location outside the repo, i have setup a config file like this for each public repo that i use. The good thing about this as well is if that file is not present (i.e. when its deployed to production) then it simply ignores it.You could also remove it with the Web.Release.config transform as well to be clean about it, example below.